Welcome to Jessie's Riding Academy!!! Since 1﻿999﻿ we continue to be a place of learning﻿ and fun, for beginners to advanced, children and adults, experienced or not everyone is welcome! 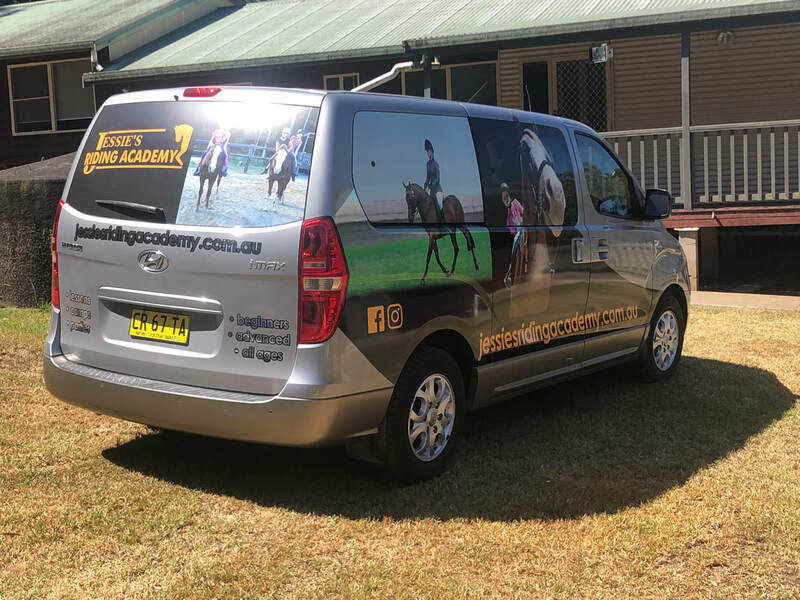 We are located in Lake Cathie just 15 minutes south of Port Macquarie offering lessons, trail rides for existing students, camps, agistment, horse starting and training, birthday parties and pony rides with our experienced instructors EA NCAS Introductory and Level 1 Dressage qualifications. We are Monday to Saturday during the school term. Whatever your reason to ride: for pleasure, to increase your confidence, own a horse, attend pony club, to begin competing or any other reason, JRA will help you achieve your goals. Although we specialize in beginners ages 4yo and over, offering the chance to learn riding and horsemanship skills, on our horses or your own, in a friendly environment, with an emphasis on fun and safety, advanced riders are welcome and well catered for! Our horses are chosen for their quiet, tolerant temperament, they are of varying sizes to suit a range of riders and are much loved, well maintained happy horses. Ask us about free after school pickup...available for Port Macquarie students. Create respect, appreciation and love for animals, help boost confidence and increase communication skills. Learn: ground control, grooming, leading, mount, control and balance in walk, trot and canter, sporting games, western, jumping, trail riding, dressage and more. Lessons are conducted in a fenced sand arena, during school terms lessons on weekdays and Saturdays and can be booked by appointment during the school holidays. We provide lesson horses or you are welcome to bring your own horse. Please wear long trousers and a shirt with sleeves that are tight fitting, closed in shoes with a heel and a smooth sole and an Australian Standard helmet that is under 5 years old. We provide helmets and a limited selection of boots sizes. ​Would you love to have a ride on a horse or pony but you're under 4yo or a lesson is not quite what your looking for? Then maybe our led pony rides are what you need. Rides are available with one of our experienced leading assistants on our lovely quiet horses. Activities include games, riding skills, jumping, sporting, ground control, horsemanship skills, safety, horse care and management. Students enjoy the opportunity to meet and socialize with people who share the same interests as themselves. With more time available to practice, the level of skill, confidence and knowledge of horsemanship and riding will rapidly increase on camps. If you would like to organise your own group, activities and suitable dates, just contact us to discuss the options adults are most welcome. * On day one of the camp please bring lunch and refreshments. * Lunch, dinner and refreshments are provided for the remaining days of the camp. * Please bring a pillow, sleeping bag and a towel. NOTE: participants do not have to stay overnight. * We ask that you leave iPads, smart phones etc at home or keep their use to a minimum. * In summer, bring your swimmers and a towel! If your child loves horses they will love to celebrate with their friends at JRA, no previous horse experience is necessary and rides take place in a fully fenced area. . Your child will have an exciting and memorable birthday shared with their closest friends and favourite animals. Mum's, dad's and their guests can have a cuppa and relax in the peaceful surroundings while the children enjoy riding, fun party games and activities supervised by our wonderful staff. Party guests need to wear sunscreen and tight fitting clothes including a sleeved shirt and long trousers. Helmets and boots are provided. If you would like to change into your best party clothes for the birthday celebrations it is best to do so after the horse activities. The kids will enjoy fun party activities, horseriding, games and prizes followed by the birthday celebrations. During this time there will be fantastic photo opportunities which will provide you with wonderful memories to look back on. Birthday parties are available on weekends, however we can make alternative arrangements if another time would be more suitable. The base package is for 6 guests (includes the birthday person) for 2hrs, provided are party invitations, decorations, tea and coffee and drinks for party guests, supervised entertainment, games and prizes, horseriding using 2 horses. We offer additional services such as: birthday cake, light refreshments and snacks, lolly bags, piñata and catering- party pies, party sausage rolls, mini dogs etc OR design your own package. A one third non-refundable deposit is required at the time of booking.